Special Containment Procedures: SCP-3857 should be kept in a standard storage locker in Site-73. 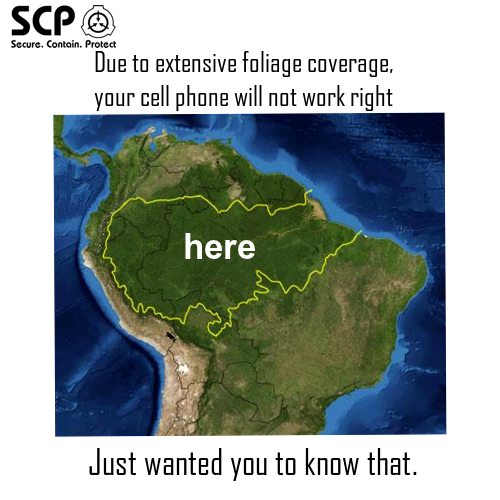 Any personnel working with SCP-3857 are to be continually reminded that tropical rainforests, especially the Amazon rainforest, are hazardous, uncomfortable to traverse, and generally unpleasant to delve into. Commons areas, offices and cubicles, and cars belonging to personnel assigned to the project are to be covered in posters and stickers depicting the following themes; insect bites, attributed to insects found in the Amazon rainforest; weather reports concerning the Amazon rainforest, with humidity readings underlined, highlighted, or bolded; or maps of cell phone coverage, clearly showing that cell connection is impossible in the Amazon rainforest1. Personnel that show any signs of desire to explore the Amazon rainforest, purchase travel clothes or equipment from Abercrombie and Fitch, or reminisce about about the lost adventure of their childhoods for excessive amounts of time should be dosed with Class-A amnestics and transferred off project. Description: SCP-3857 is a black and white photograph depicting Theodore Roosevelt, the 26th president of the United States, dressed in Abercrombie and Fitch gear for a hunting expedition in front of an artist's depiction of an unidentified forest. The photograph, notably, appears to have been printed in ████, or ██ years after the former president's death. Subjects in the vicinity of SCP-3857 will begin to experience intrusive, recurring thoughts about the Amazon rainforest, and, regardless of previous thoughts on the matter, will begin to find the idea of exploration increasingly appealing. Many subjects will posit it as a means to return to their youth or childhood. If allowed to progress further, subjects will attempt to, by any reasonable means available to them, journey to the Amazon rainforest. Subjects will inevitably follow the path of Roosevelt's 1913 expedition along the Roosevelt River2. As most subjects are not prepared for the expedition, casualties are common. Most subjects are fairly easily dissuaded. Appeals to logical thinking, especially based on outlooks previously expressed by subjects, is generally enough to counter the effects of SCP-3857. Foreword: The following is a transcript of a speech made by an SCP-3857-affected personnel member to his colleagues. Despite having been under the influence of SCP-3857 for several months, the subject made a full recovery after treatment with amnestics. The amazon! The mother river! Oh, to be young again, to be gone from the confines of this civilized earth! To be free! Look at her here. [ Subject gestures at a black and white map, recently printed using company printers. Image is noted to be first result offered by ████.com's image search engine. ] The curves! The luscious terrain, the feminine beauty! Does she call you, how she calls me? Does she ask you to reclaim your boyhood and your manhood? I need a team. You, ██████, you will be our guide. You will use your savage roots, the inherent fire in your blood, the call of the wild, to lead use through the treacherous terrain! [ protests from ███ ██████ are heard by the subject ] Korean? What nonsense! ████. You will be our guard. You will defend us against threats from savages and wild animals, function as barrier between life and death, for only through proximity to death do we live! █████, my oldest friend. My brother, I might even say, my son. You will be my right hand man. In a land so removed from civilization, from humanity, you will be my spirit guide. Oh, to live! Pass the salt, would you, ████?